So I bought into a racehorse partnership earlier this year (more on that another time). There were several 2 year olds to choose from so we were invited down to the barn to meet them and have a look. One of the older horses in the barn was Queen of Hearts. 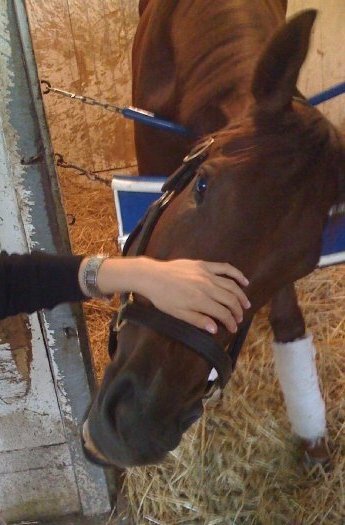 Out of all the horses in the barn, she was clearly the friendliest and had the most personality. She repeatedly “smiled” at us – showing off her not-so-pearly whites – and kept wanting to nuzzle and be pet. At the time she was still a maiden. Since then she has broken her maiden, won an allowance race, and run a good 3rd to Mushka in the Glen Falls Hdcp at Saratoga. She’ll have to keep improving to have a shot in the Flower Bowl, but for sentimental reasons I’ll be rooting for her. Queen of Hearts smiling and demanding some attention from my girlfriend! Tagged with Belmont, Flower Bowl, Queen of Hearts, Racehorse ownership, thoroughbred ownership.